These earrings display a pair of tri-color diamond cut hollow tube hoops. They are lightweight, have a comfortable fit and are an ideal size for daily and evening wear. These medium hoop earrings are approximately 1-inch in diameter. They are high quality fashion earrings, crafted of 14k yellow, white and rose gold and secure with click-top back findings. 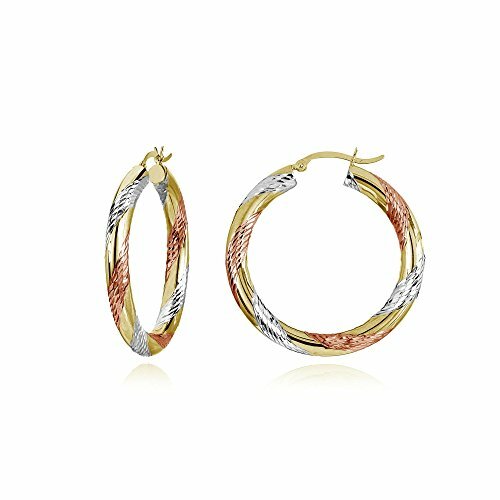 Hoops and Loops illuminates fashion ambiance of the contemporary and modern appearance. Wear our jewelry, feel the excitement. Sterling Silver Jewelry, 14K Yellow & White Gold Jewelry, Yellow Gold Flashed Jewelry, Rose Gold Flashed Jewelry, Black Plated Flash Jewelry Hoop Earrings, Tennis Bracelets, Stud Earrings, Dangle Earrings, Drop Earrings, Italian Chain Necklaces, Beach Jewelry, Toe Rings & Anklets, Cubic Zirconia CZ Jewelry, Polished Metal Jewelry, Bridal & Engagement Jewelry, Eternity Bands, Polished & Basic Jewelry, Two-tone & Tri Colored Jewelry, Infinity Designed Jewelry, Trendy Jewelry, Jewelry for Adults, Women & Kids. These earrings display a pair of tri-color diamond cut hollow tube hoops. They are lightweight, have a comfortable fit and are an ideal size for daily and evening wear. These small hoop earrings are approximately 1-inch in diameter. They are high quality fashion earrings, crafted of 14k yellow, white and rose gold and secure with click-top back findings. Wear these earrings as wedding jewelry, holiday jewelry, Christmas jewelry and more special occasions. Give this as a gift to your woman, wife, girlfriend, mother or your teen girl for her birthday, graduation, anniversary, Christmas, Hanukkah, Mother's Day and Valentine's Day. This is a Jewelry Piece that Complements Your Personal Style and Design. It is Fashionable and Comfortable to Wear. This Jewelry Piece makes a Cherished Gift for Family and Friends. Each Product is Nicely Packaged in a Jewelry Pouch. If you have any questions about this product by Hoops & Loops, contact us by completing and submitting the form below. If you are looking for a specif part number, please include it with your message.